I don't know about you, but I could happily eat seafood three times a day. Shrimp and Grits for breakfast, baked fish for lunch, gumbo for supper, and I'd be perfectly happy. 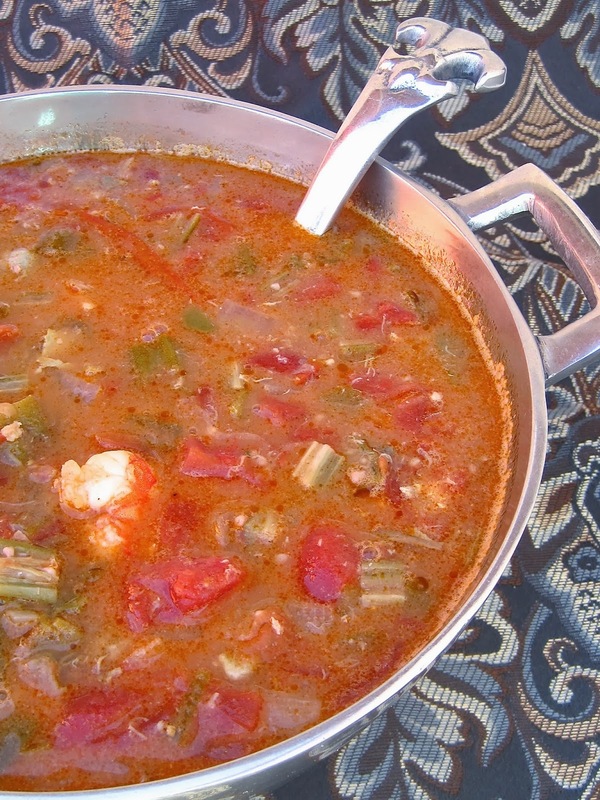 And this week, I tried a new Seafood Gumbo recipe that truly feeds a crowd! This recipe came from a cookbook that's my age, the 1964 "Woman's Exchange Cook Book, Volume 1" from The Woman's Exchange of Memphis, Tenn. 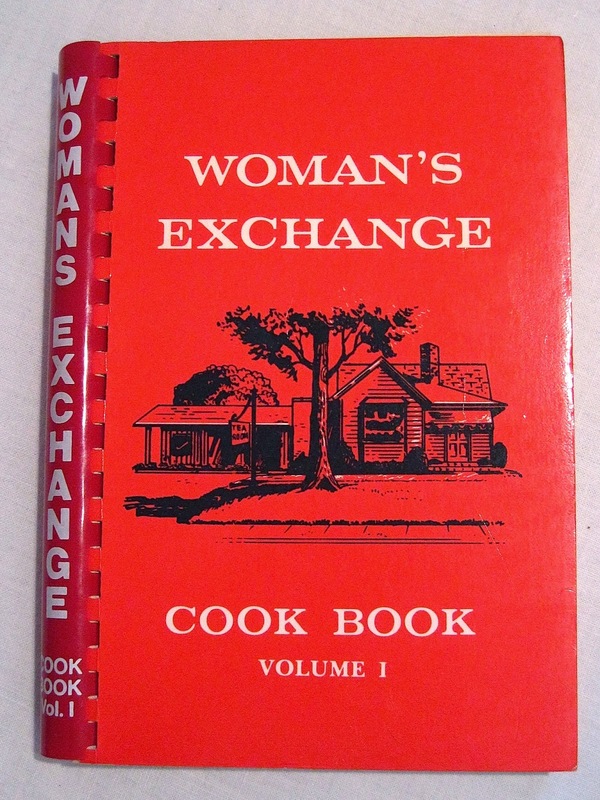 According to the book, the Exchange started as an outgrowth of the community kitchens operated during the Depression and "has now (in 1964) grown into a thriving organization operating in its own home at 88 Racine Street, a shop offering handmade clothing, toys, linens, gift items, fine arts, antiques, and the popular TEA ROOM." When I found out this tea room is still operating today, it went on my Bucket List of tea rooms to visit! 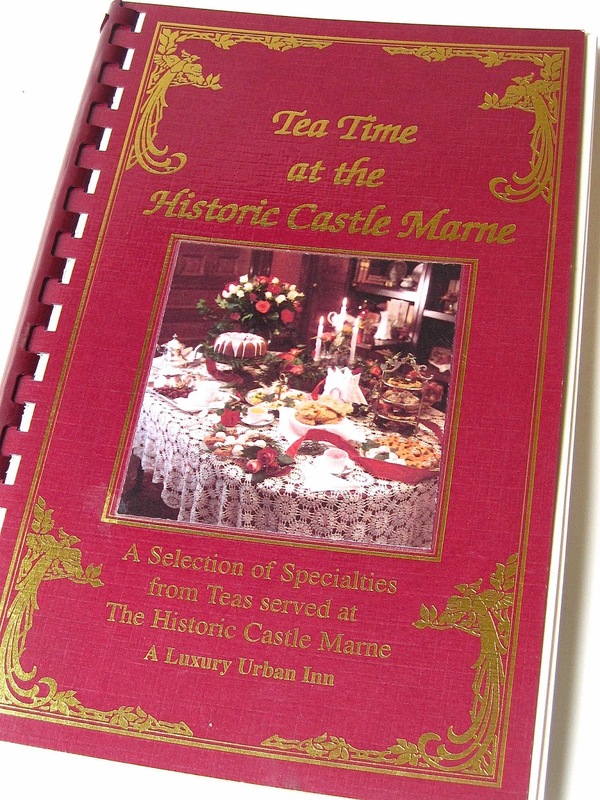 The Tea Room specialties featured in the book include a number of dishes I want to try, such as Frosty Strawberry Squares, Old Fashioned Blackberry Jam Cake, and Granny's Chocolate Cup Cakes with Mocha Frosting. 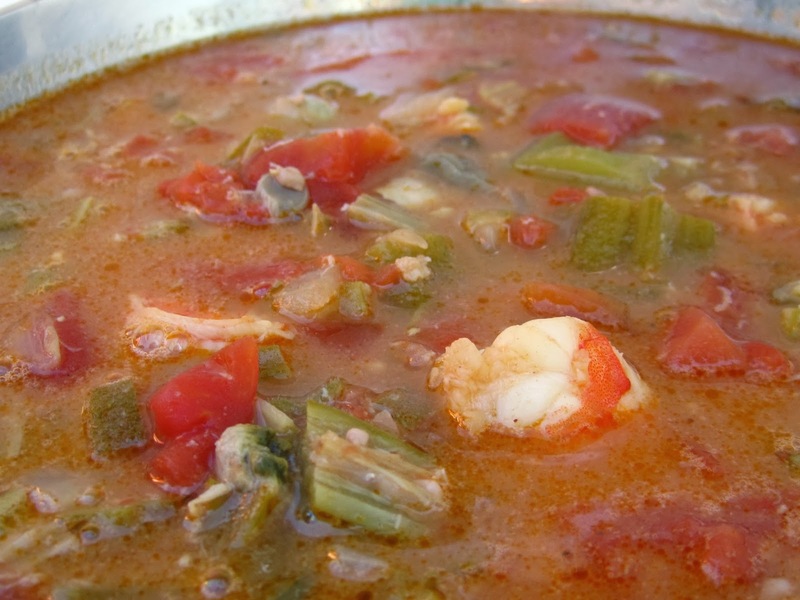 For now, though, I'm going to have some more of this gumbo! Saute onion in fat for 3 minutes, then add flour and stir until onions begin to brown. Add tomatoes and water, cover, and cook for 30 minutes. Reduce heat, add okra, peppers and garlic. Bring to a boil, then reduce heat and cook for one hour. Add crab, shrimp, salt pepper, Tabasco and Worcestershire sauces, return to a boil, then reduce heat and cook covered for 30 minutes. Add nutmeg, file, oysters and lemon juice, then cook on low for 30 minutes. Serve over rice. 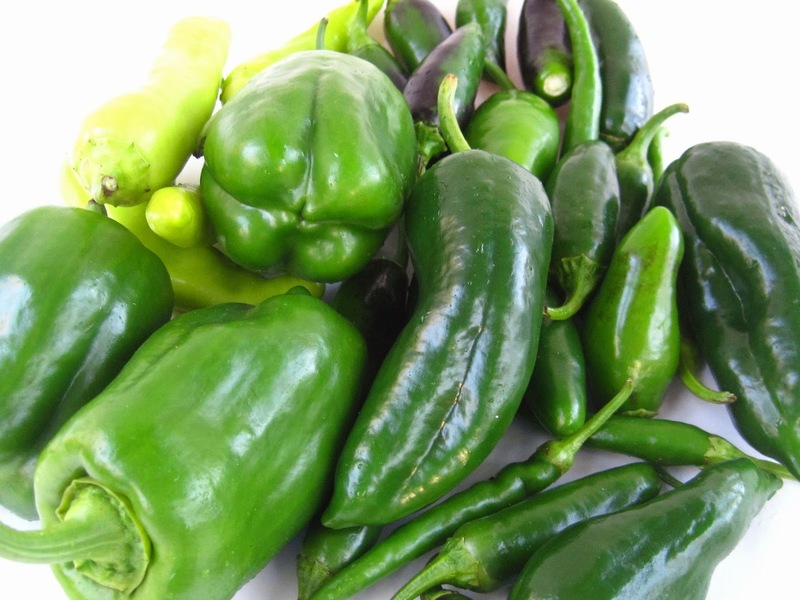 Yields 1 gallon, or 12-14 large servings of gumbo! 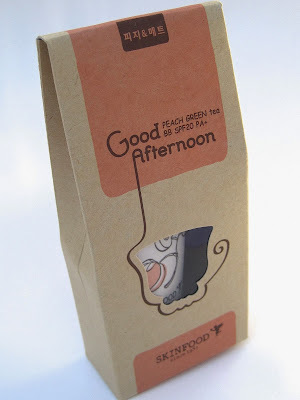 … I found the steeped tea had a grapelike scent. 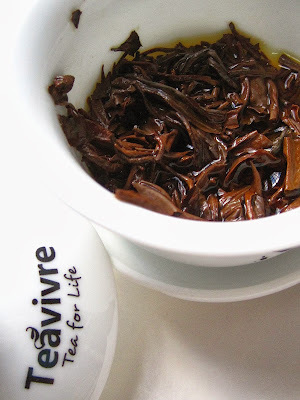 After sipping so many flavored teas these past few weeks, it was nice to sort of "cleanse the palate" with a straight-up black tea like this one. 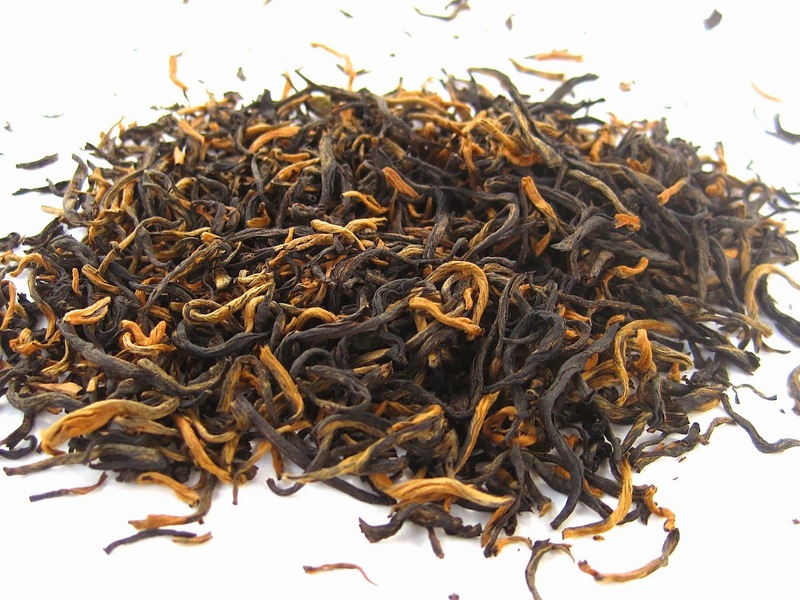 The taste was rich and full and with very little astringency. (This tea will also go great with the plate of desserts I happily brought home from my sister's wonderful Thanksgiving spread yesterday!) Oh, and if you're more inclined to shop online than in-store today, I noticed that Teavivre teas are on sale right now. If you are out shopping today, be careful out there! 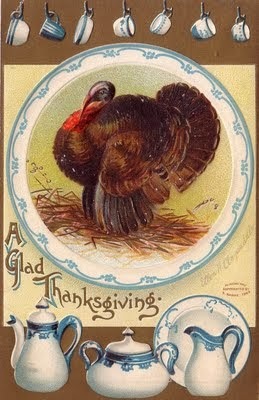 Wishing "A Glad Thanksgiving" to all my tea friends! Actually, "In Between" is probably more like it, as it will take a few more polishings to tidy up this 3 x 5-inch silverplated creamer I found on eBay. 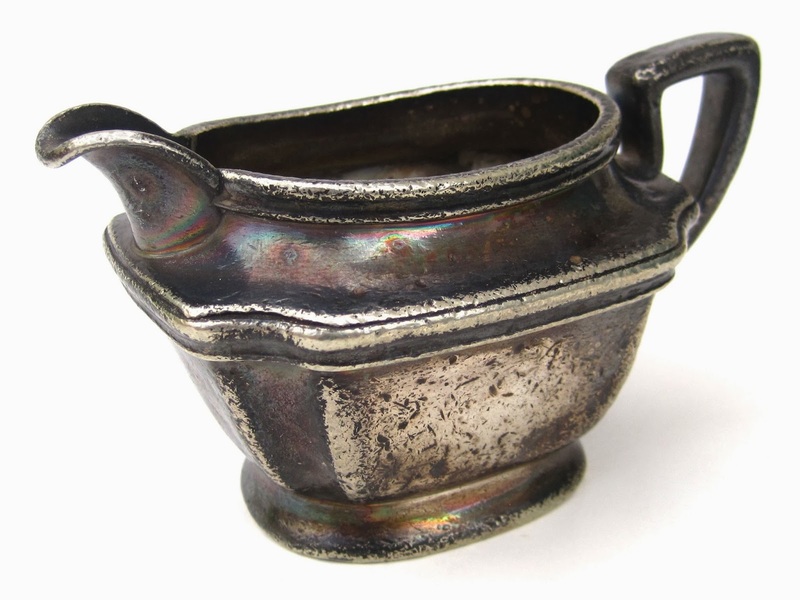 Why would I want a dinged-up old silver creamer? Because it came from a tea room! 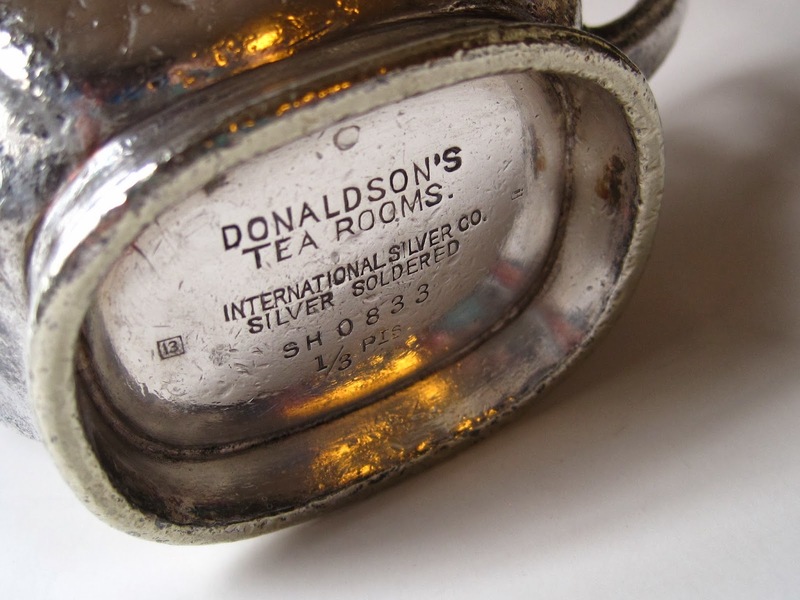 Donaldson's Tea Rooms once served customers of Donaldson's Department Store in Minneapolis, Minnesota. 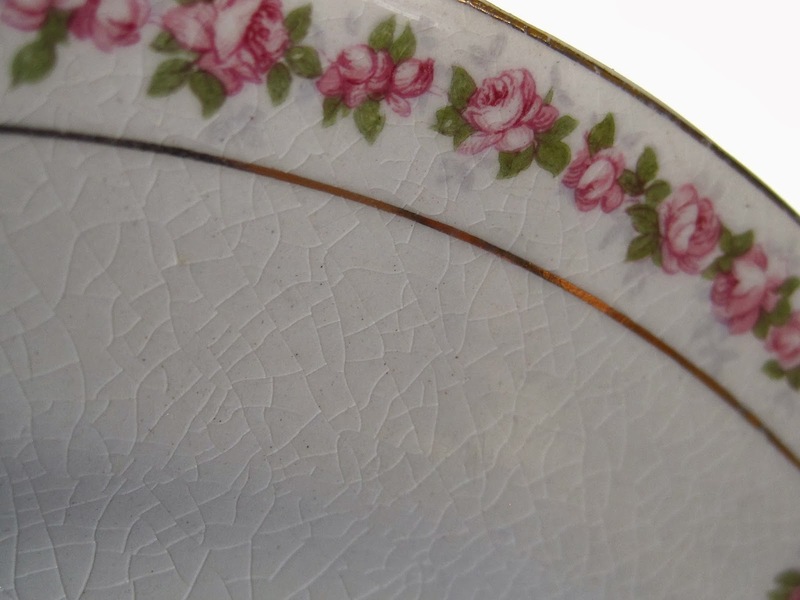 This piece will now join another department store tea room collectible, the Halle Bros. 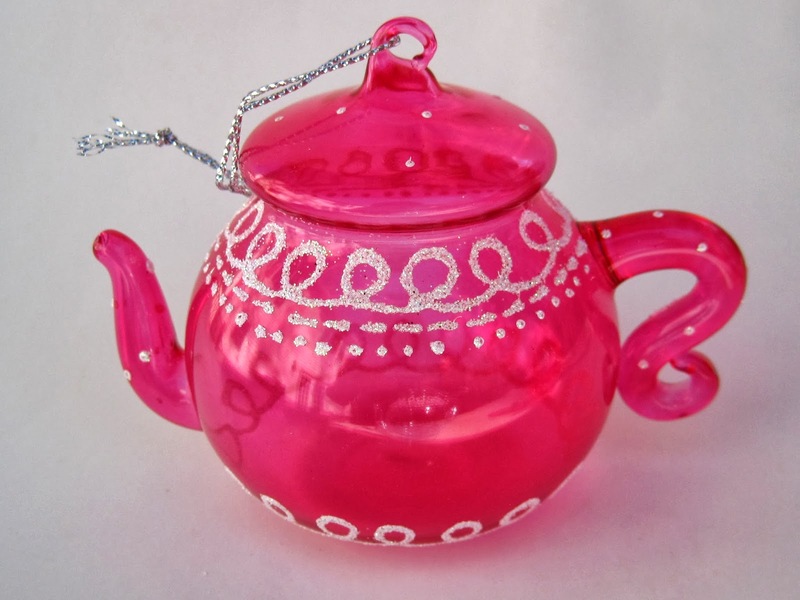 Tea Room tea pot I have, and I'll bet they swap stories on the mantel overnight, don't you? Yes, I know, I usually share tea room recipes on Saturdays, but a) I got behind one week this year and b) a pumpkin recipe really ought to be shared before Thanksgiving! 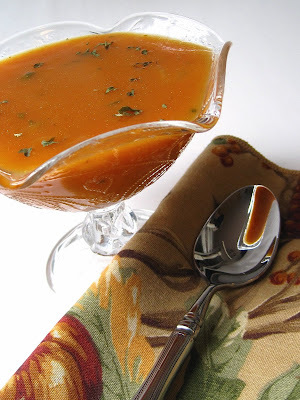 I just discovered this delicious and super easy Pumpkin Bisque, and if anyone needs a quick soup course for Thanksgiving, I can't imagine what could be easier than this! The recipe comes from a terrific undated cookbook I came across online, "Tea Time at the Historic Castle Marne." It's described today as "a luxury urban inn," but the "castle" dates to 1889 and, according to the book, "is considered by many to be the finest example of 'America's most eclectic architect,' William Lang (designer of Unsinkable Molly Brown's house)." It's located in a historic district, is on the National Register, and continues to offer teas today. If I ever go to Denver, this is where I want to stay! The book includes lots of great recipes I want to try, including several tea breads, but the Pumpkin Bisque is what got my attention this week, and oh, was it good. I was quite surprised that a bisque without heavy cream could taste as thick and rich as this one did! In a large soup pot, sauté onions in butter until translucent. Add pumpkin and chicken stock and cook over medium-high heat for 10 minutes. 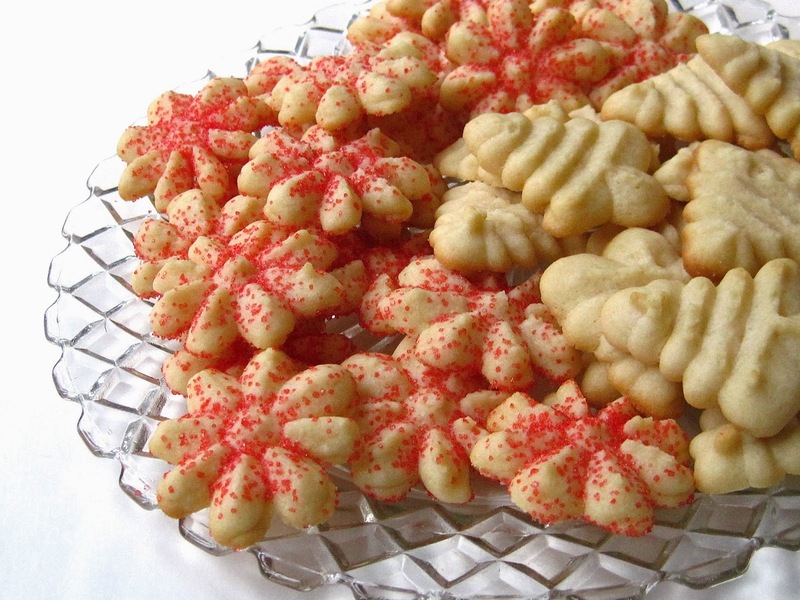 Remove 1 cup of the pumpkin mixture into a separate bowl, add the flour, and whisk until all lumps are removed. Add flour and soup mixture to pot and whisk well. Cook for 5 minutes, whisking to remove any remaining lumps of flour. Add salt and garnish with parsley. Yields 8 servings. This week I am sipping tea out of my new souvenir mug I got after seeing the Rockettes at the Cobb Energy Centre in Atlanta last week. 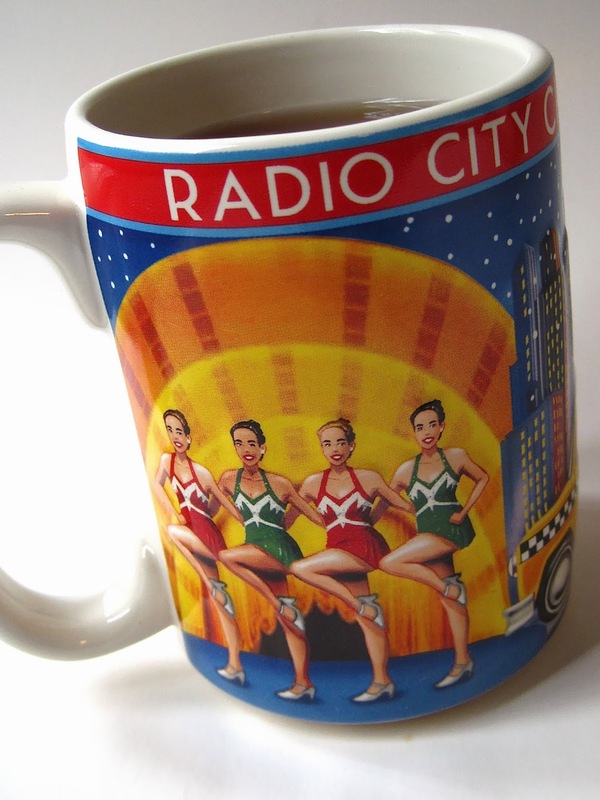 The Radio City Christmas Spectacular was indeed *quite* spectacular, and I loved this mug they had at the souvenir stand, especially since it showed the classic dance line we all think of when we hear the word "Rockettes." 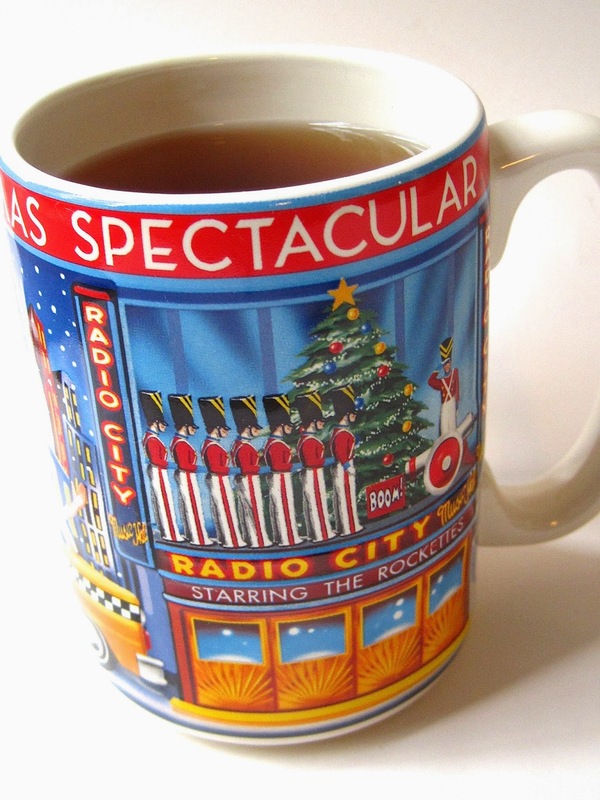 This side of the mug recalls one of the memorable production numbers in the show, and they were many! I happened to sit next to a woman who was attending the show with her 92-year-old mother, a fun woman who said she had seen the Rockettes once before—back in the 1940s! (When she told this to the young man who sold her a program, he warned her it probably wouldn't be the same girls dancing this time.) The woman's daughter told me her mom came to New York from Czechoslovakia and lived in Little Italy, where the mob took care of her family. You just never know what interesting folks you'll meet, do you? 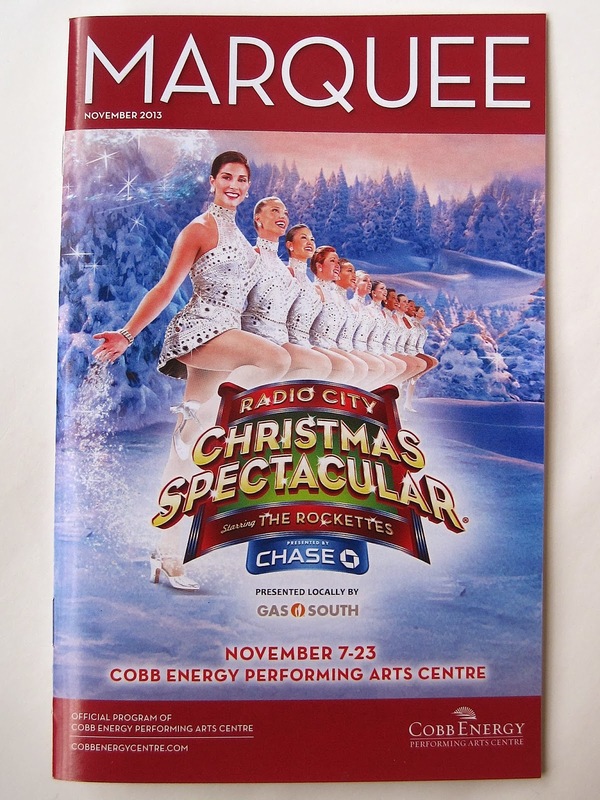 To be honest with you, though, seeing the Rockettes had never been a big item on my Bucket List, but it was absolutely at the top of the Bucket List for my Aunt Jane, my mother's younger sister, who is mildly mentally retarded. She is very dear to our family, and living life with Aunt Jane has been, well, an experience! When I was younger, I was worried my friends would think bad of me for having an aunt who was "different." Fortunately, I had parents who demonstrated that that kind of thinking was not acceptable, and besides, my mom always said the people in her family were such oddballs anyway you'd have had a hard time picking Aunt Jane out in a crowd of them. (True, that!) Frankly, I think her "difference" has been a blessing to us in many ways, because it's certainly taught us to be accepting of all kinds of people. When I take her shopping these days, I have to be sure she gives the salesclerk the right amount of money and gets back the correct change. Again, when I was younger that embarrassed me, and I asked my mom once why that no longer bothered us as the years went by. My mom said most of the young salesclerks today can't make change themselves without a computer to do it for them, so they don't think anything of Aunt Jane asking for help. Ha! Well, I didn't mean to ramble on about that, but just to let you know that when I surprised Aunt Jane with a trip to see the Rockettes (whom she always calls "The City Rockettes"), I thought she was going to have a heart attack. I knew better than to tell her before we pulled up to the center, and I'm glad I didn't because she is *still* talking about it. Oh, if you could have seen her clapping and smiling her way through that show … at one point, I heard some off-key singing and realized she was joining along in "Hark the Herald Angels Sing," just singing and clapping her heart out. 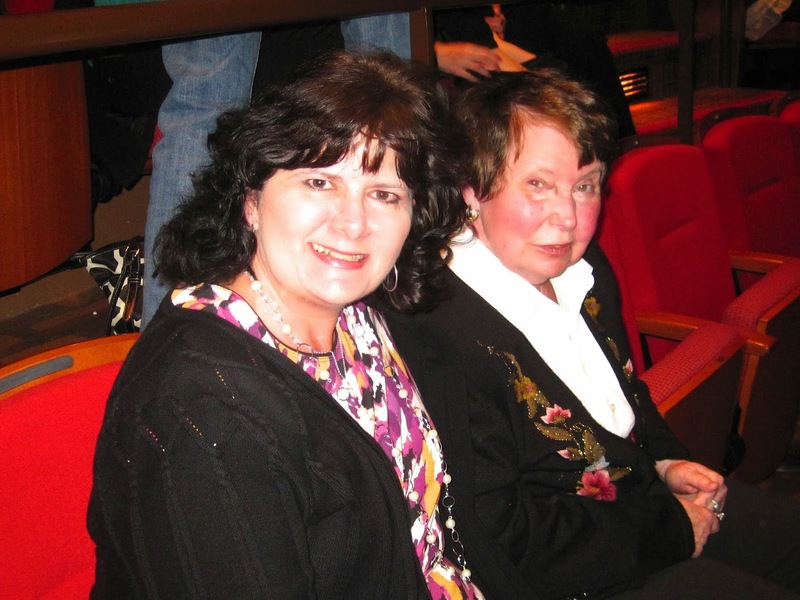 As we left the theatre, I got a surprise myself when Aunt Jane grabbed me in a bear hug and said, "God bless you, Angela! ", a phrase I've heard her say just a couple of times in my whole life. God blessed me, indeed. (And hey, God bless the City Rockettes!) Before we left I asked the 92-year-old, who at one point actually kicked up a leg in imitation of the Rockettes, which dancers were better, those of the 1940s or those of today. She jerked a thumb toward the stage and said, "Today!" I definitely recommend seeing the show if you get a chance! I love to see a tiny little bite-sized chocolate treat on a tea tray, so when I came across this recipe for Brownie Tea Cakes, I knew I wanted to try it. 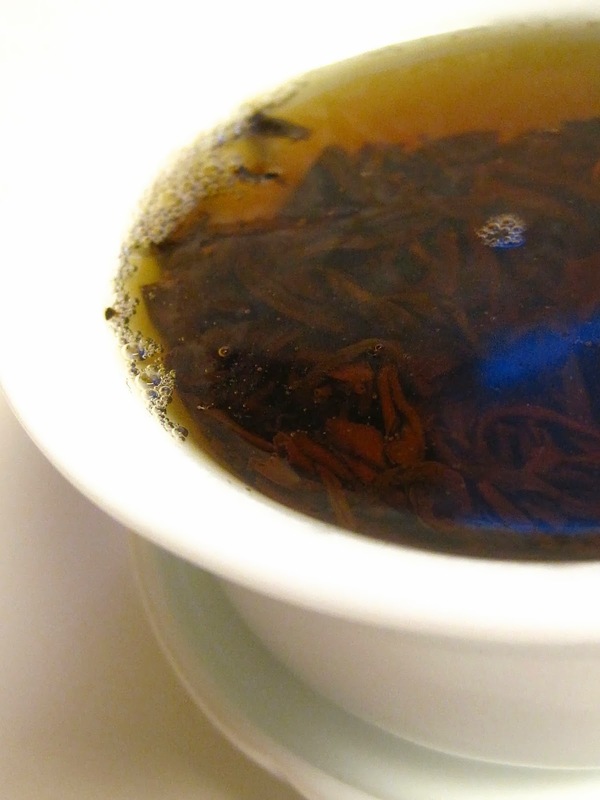 This recipe comes from one of my favorite tea cookbooks, "A Year of Teas at the Elmwood Inn" by Shelley and Bruce Richardson (1994). The legendary Elmwood Inn in Perryville, Kentucky was on my bucket list of tea rooms to visit, but it closed in 2004 before I could get there. Happily, though, the tea room's recipes have been preserved in many books by the Richardsons and of course today they are also known for their own line of teas. Bruce Richardson is well known to readers of Tea Time magazine and other tea publications for the many tea articles he has written over the years. I had the pleasure of meeting him (briefly) at two different tea conferences, and I remember being impressed that such a knowledgeable tea expert was such a down-to-earth guy. I wouldn't have been surprised if he were a tea snob, but that could not have been further from the truth. 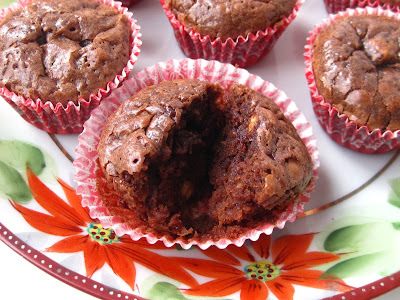 I have used a scone recipe from this book for years, but this week I decided to try the Brownie Tea Cakes, and they were awesome! Preheat oven to 350 degrees. Melt butter and chocolate squares over low heat. Remove from heat, add sugar and combine. Add eggs, one at a time, beating well after each addition. Stir in vanilla. The other day I ran in the LifeWay Christian Store in Douglasville to pick up a gift for a dear friend who was retiring from teaching. While I was there, I saw a new flavor of Scripture Tea I wanted to try, Apple Cobbler. 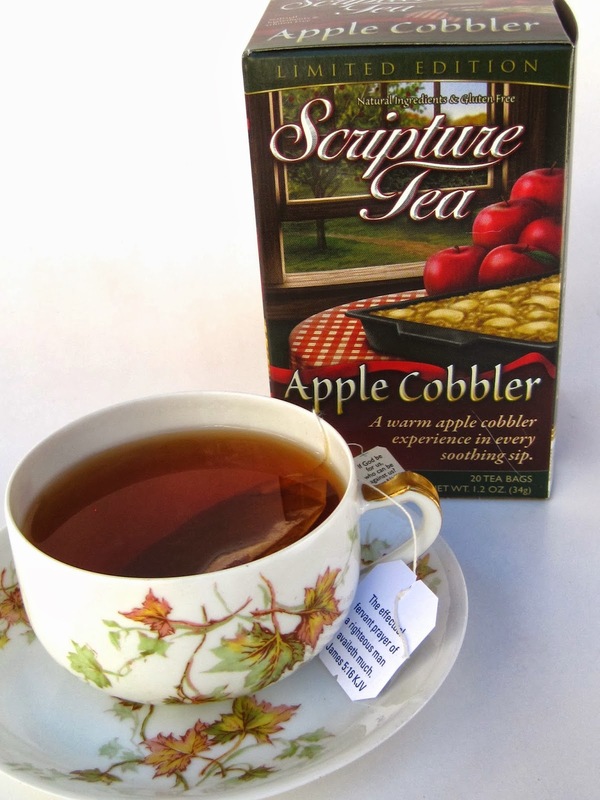 Unlike other apple flavored teas I sip in the fall, this one had a heartier feel to it thanks to the addition of cinnamon and chicory, among other ingredients. 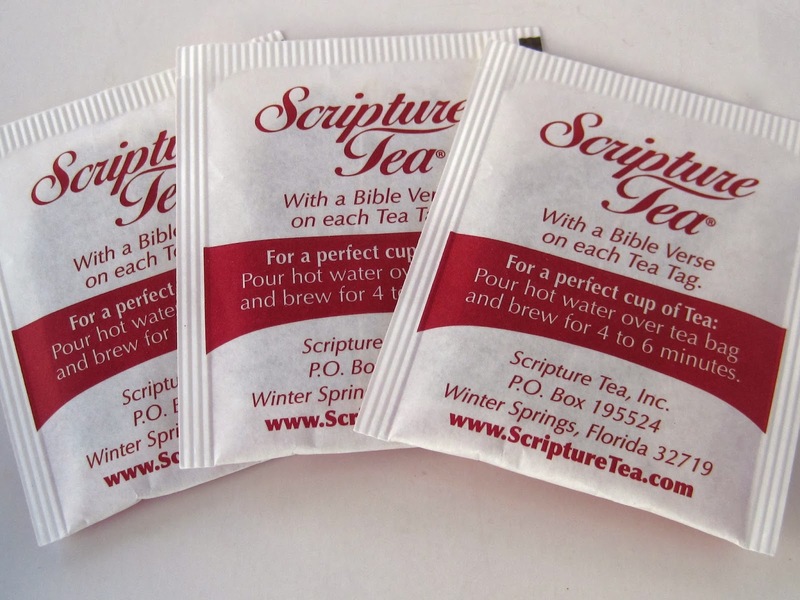 (Find out more about Scripture Teas here.) 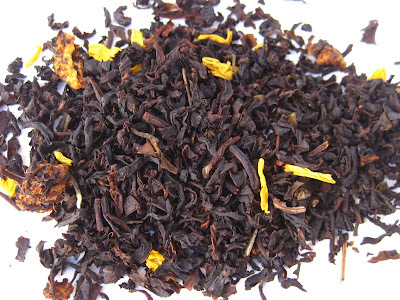 It made for a delightful cup of warming, fall-flavored tea along with my afternoon snack. I love to see which scripture is hanging on each tea bag, and I always seem to come across just the one I need. 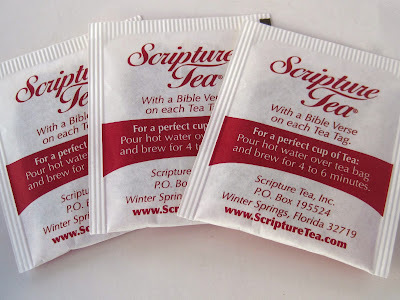 I've also found Scripture Tea blends at Cracker Barrel stores, and especially for anyone involved in tea as a ministry, these are some worthwhile teas to search out! 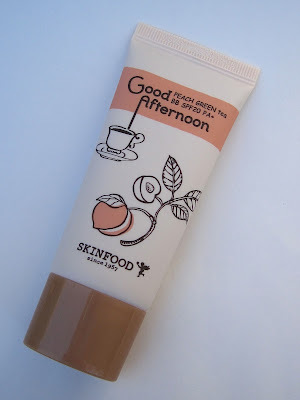 I absolutely loved the packaging and the design on the tube! The cream itself, I am pleased to report, far surpassed my expectations. First, it had a light floral scent I absolutely adore. (That would be a problem for some who dislike fragrance, but I love it.) 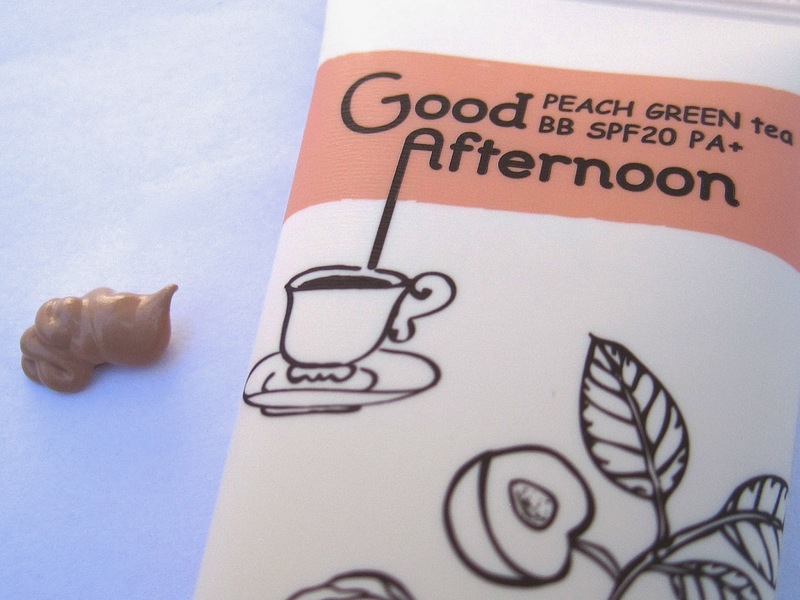 It went on smooth as silk, and I happened to get the *perfect* shade of BB cream for my skintone. I had planned to use this as a primer/sunblock only, but it looks so good, I'm perfectly happy using it in place of foundation. 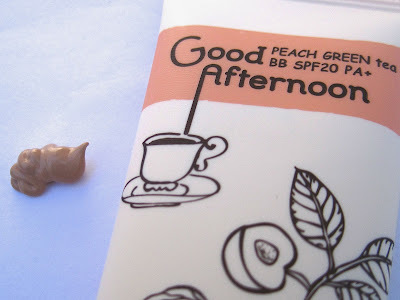 So have any of you tried BB creams? If so, what do you think of them? Friends, I really didn't mean to write about three Christmasy things in a row right here in mid-November, but Margaret in Canada was kind enough to send me a shopping alert, and so I had to pass it on to you! 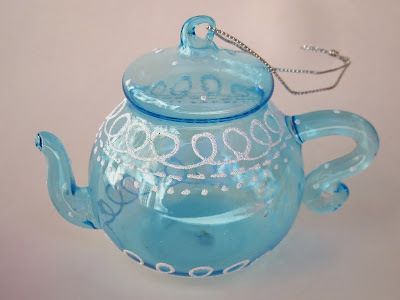 She found some glass teapot ornaments there on clearance and wanted me to know about them. 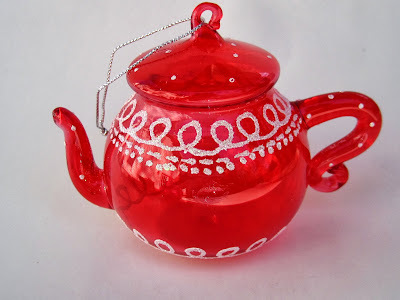 Naturally I went to Target the very next day, and I bought all three of the teapot ornaments left hanging there! She found the ornaments in Canada were marked half off, but alas, mine were full price ($5). Still, that's a much better price than you ever see for *vintage* glass teapot ornaments, and if I can keep from breaking these pretties, that's what these will become someday. The blue one is so frosty and lovely. … the red one is just so cheerful, I can see it contributing to the Christmas decor for many years to come. And I promise, that's the last thing I'll say about Christmas this week! The other day I stopped by Treasures Old & New here in Newnan, a new antique mall where I've had success finding tea goodies. This time, I was on the lookout for vintage Christmas recipe booklets needed for a project I'm researching. Happily, I found a stack of them, at very good prices, at the very first booth! 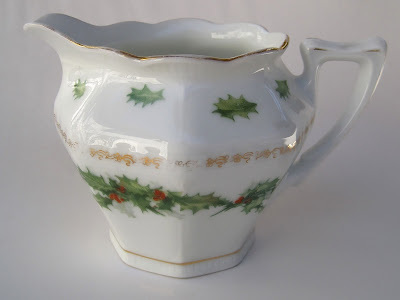 I'll probably share from them soon too, but the other thing I found was also a Christmas item, a vintage cream pitcher I absolutely adore. 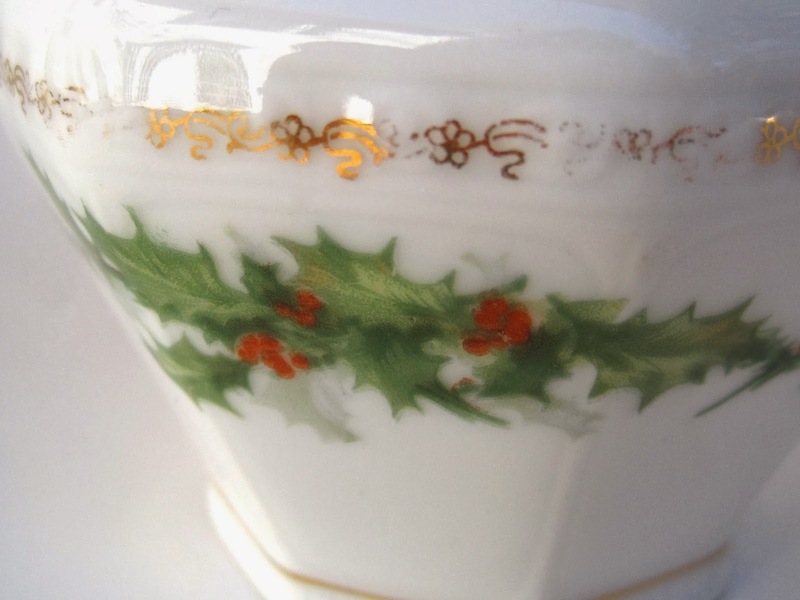 The soft colors of this holly design are just beautiful. 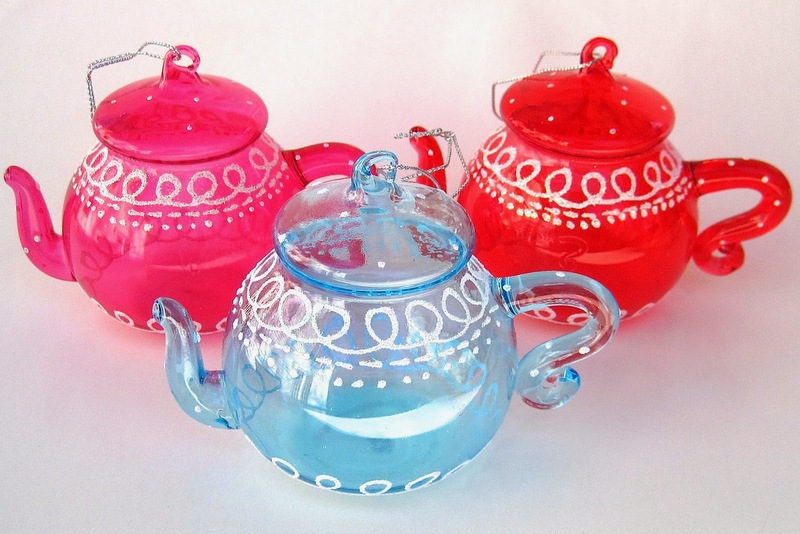 I am now fantasizing about finding the matching sugar bowl, some teacups (surely they exist?) and perhaps a teapot as well. 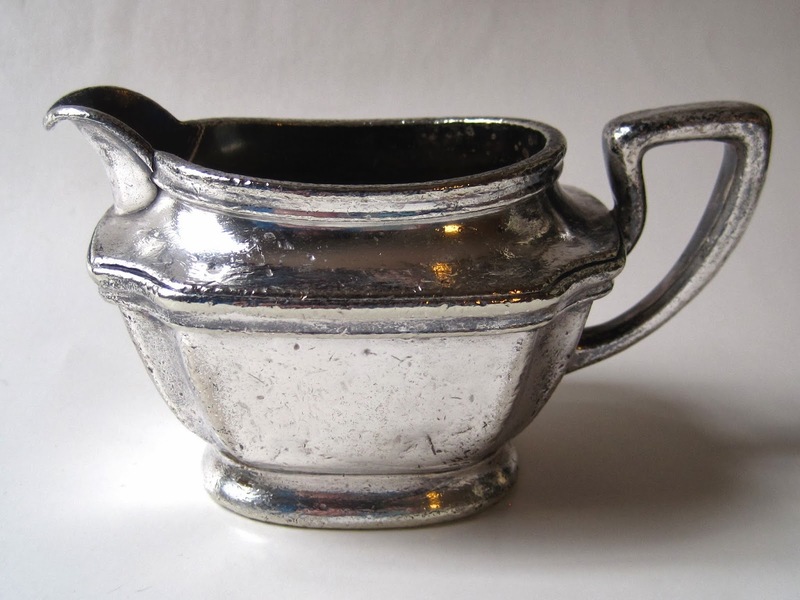 I told the nice lady who checked me out to please find the sugar bowl for me, and she just grinned. 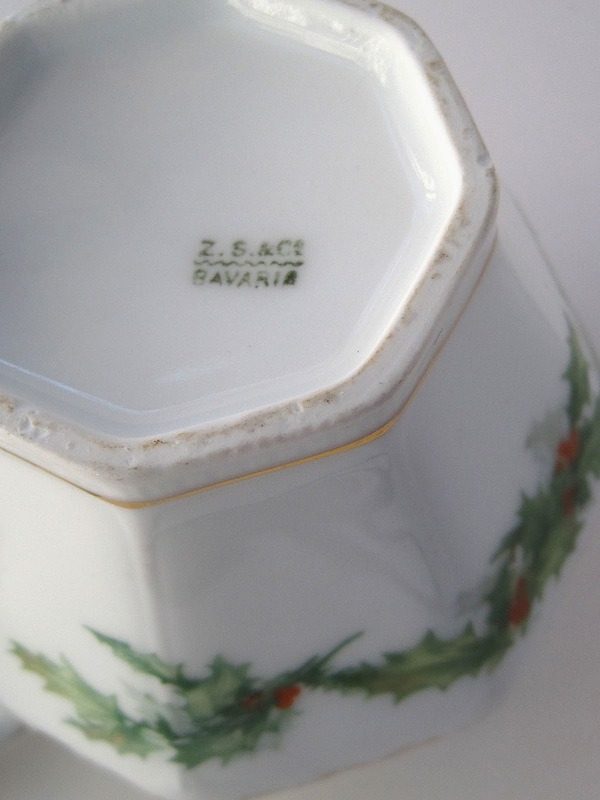 Over the years I've realized that old Bavarian teawares are among my most favorites. The backstamp says Z.S. & Co., and of course I looked online immediately hoping to find matching pieces, but with no luck. I always have a backup plan, and I'm going to use this 3-1/4 x 5-1/2-inch piece as either a vase or a silverware holder until I find other pieces, but if any of you should happen to spot some mates, please, please let me know! It's time to start thinking about Christmas cookies, and my Christmas baking kicked off this weekend with my first-ever attempt at making those buttery spritz cookies using a cookie press. This was so easy, I should have tried it sooner! 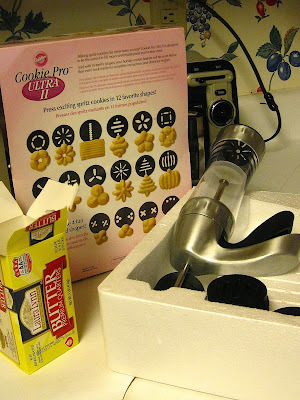 I was inspired when I cleaned out the pantry a few weeks ago and discovered a Wilton Cookie Pro cookie kit I got for Christmas several years ago. First, I mixed up the simple butter cookie recipe and chose a shape from among the discs included in the box. 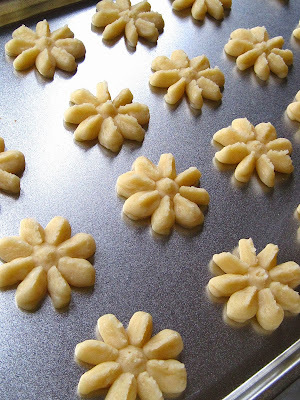 Soon, I was squeezing the trigger of the cookie press and watching pretty little bits of dough appear. 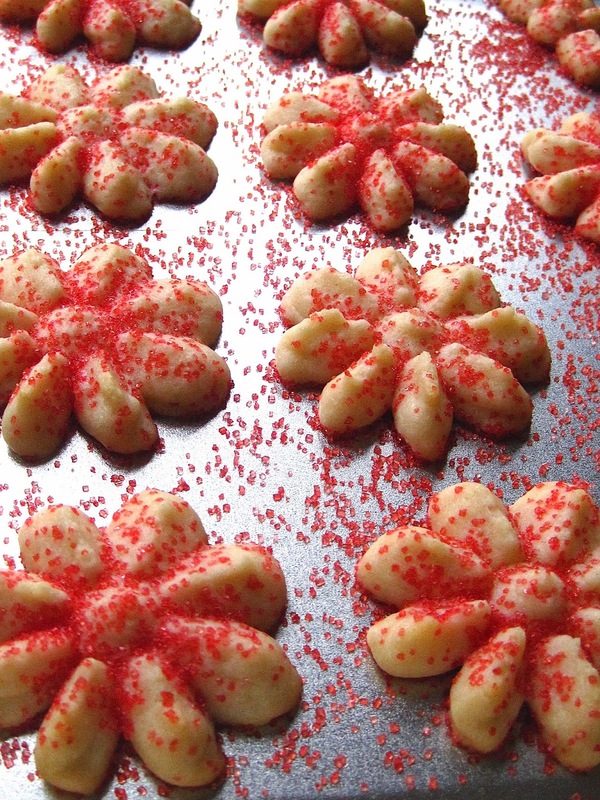 A few sprinkles later, and voila, Christmas cookies! 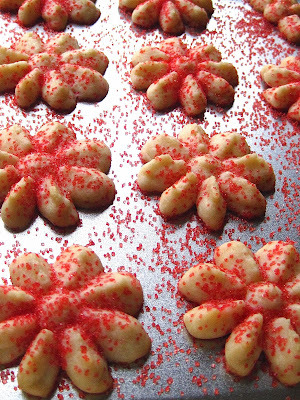 I made Christmas tree-shaped cookies too, and it couldn't have been easier. 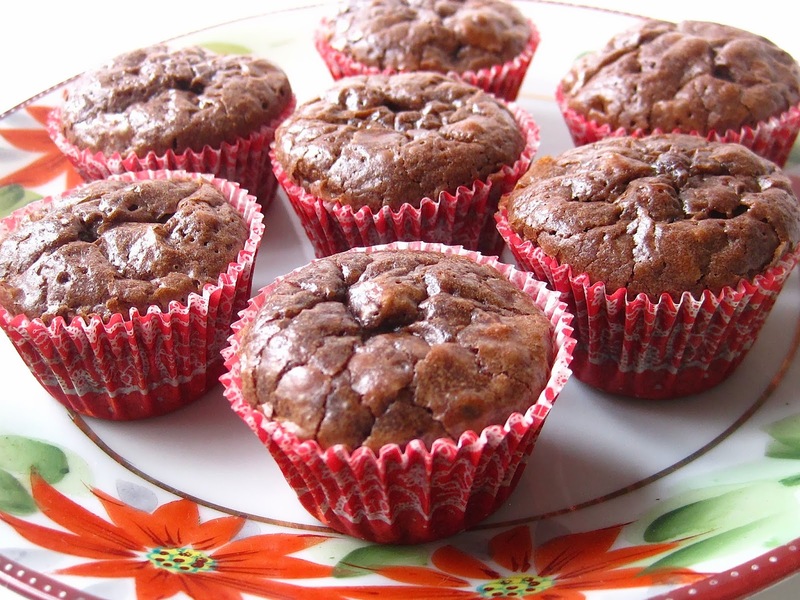 With some tea, these small buttery treats made a perfect snack. The more "experimental" ones were for my husband and me to enjoy, and the prettiest ones have gone in the freezer for Christmas gift-giving. 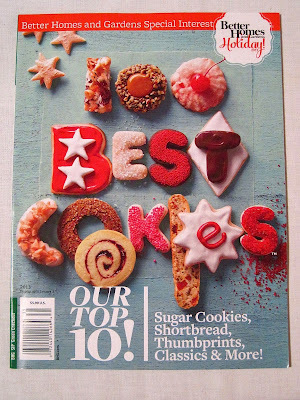 Next, I want to try one of the many delicious options in the new magazine I found at the grocery store the other day, 100 Best Cookies. 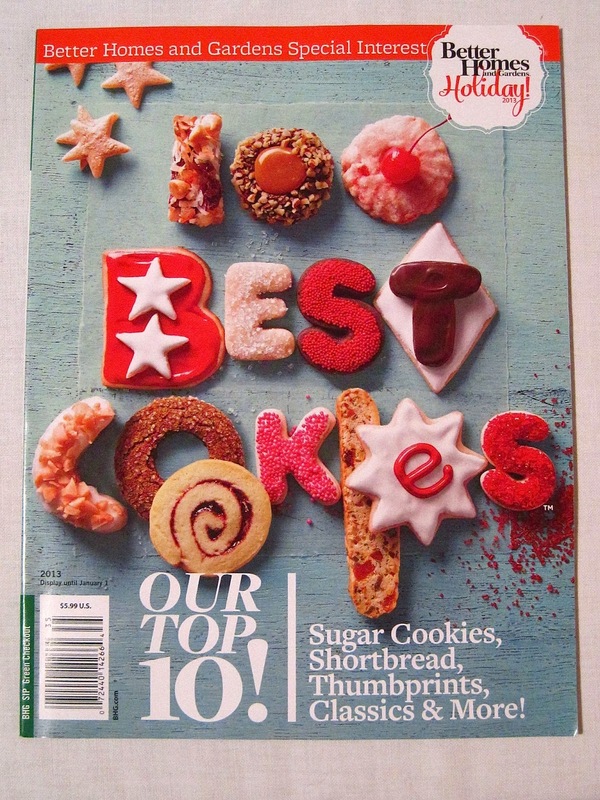 On the cover, I really like that first zero in "100" at the top, a little thumbprint cookie with a dab of caramel in the middle. 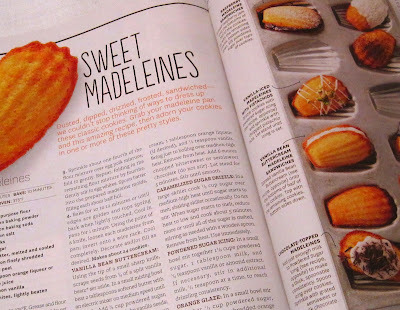 Tea lovers will appreciate the feature on ways to dress up madeleines, and there are also 10 recipes for shortbread, including a Red Velvet Shortbread Cookie that looks wonderful. I've thought about it, and a good old-fashioned chocolate chip cookie is probably my favorite kind of cookie, but what's yours? 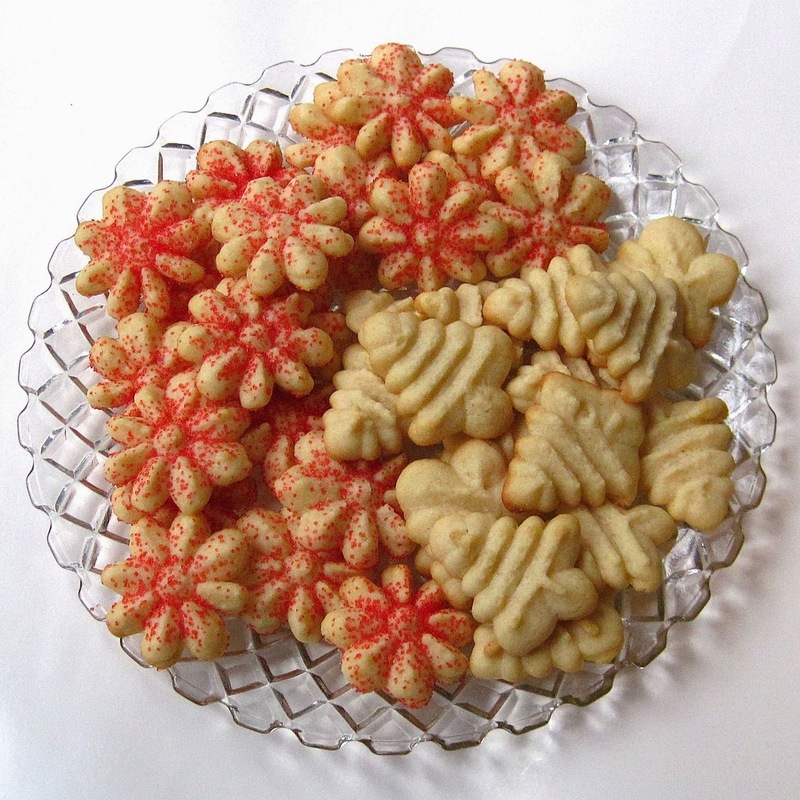 If you were to get a gift of cookies, what would you hope it included? I'd like to surprise a few friends with cookies this year, and it occurred to me you all might give me some good advice! Some recipes, frankly, have such a bizarre combination of ingredients that you a) wonder how on earth this could work and b) suspect that it just might. 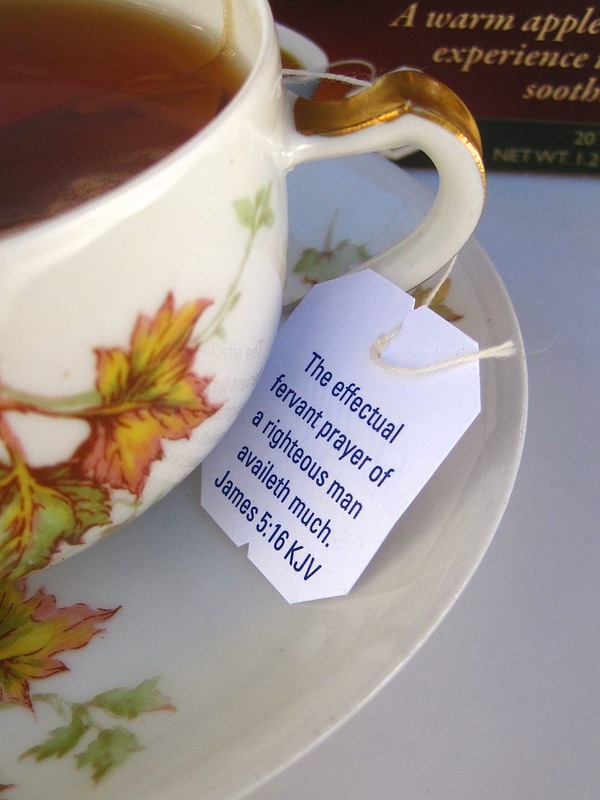 That's the case with this week's delightful recipe from a small tea room in Texas. Tea room cookbooks are just so fun to read. Idyl Hours Tea Room in Cypress, Texas closed in 2009, but the tea room's owner, Stella Riley Pinson, has compiled some of the tea room's favorite recipes and made them available in a cookbook on Amazon, which is where I found my copy of "The Idyl Hours Cookbook." Here is what she says on her Amazon page: "This isn't a book of recipes for high tea. 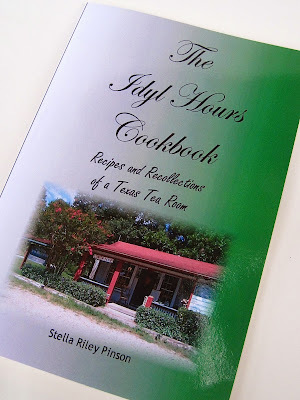 This is a book of recipes from a little tea room in Texas. It's peppered with local history, artwork, and photos." I love how she spelled that out, because some folks are still unaware that American's earliest tea rooms were not Victorian tea parlors with lace doilies and three-tiered servers. That may be what we think of today, yet I think it's important to honor past tea room history by acknowledging the hardworking women (and men!) who had the gumption to open quaint little restaurants where travelers, and locals, could stop and enjoy a nice meal. 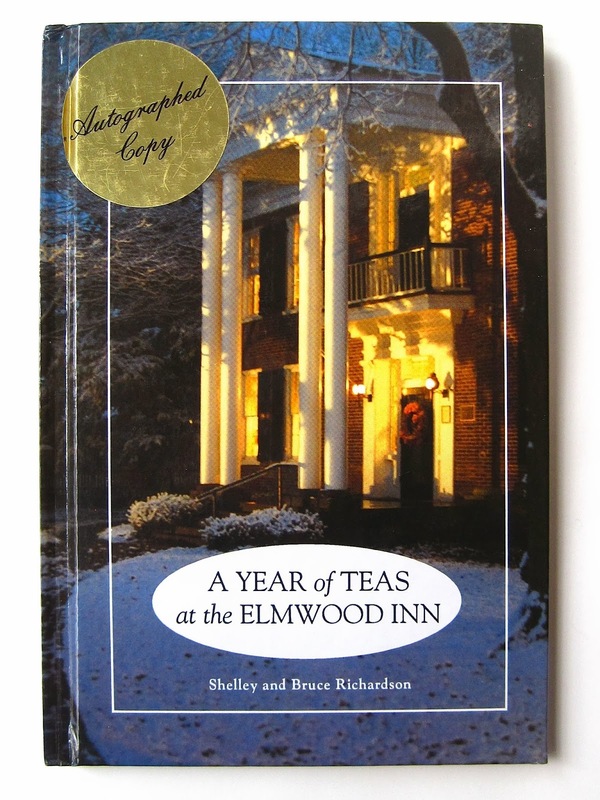 Also, Pinson's story of how she came to acquire the tea room is a great read! And the recipe I decided to make from this book was fun and easy to cook! If I told you to spice up some baked chicken with a combination of apricot preserves, French dressing and onion soup mix, would you be skeptical? I was, and yet somehow I had a hunch this could work. For one thing, the tea room entrees I have tried this year have all been wonderful. In fact, only one tea room recipe so far this year turned out to be a dud. (Which one? Well, it was a dessert, a chocolate cake recipe from a tea room in Mississippi. This thing turned out to be so dreadful that my husband tossed it out in the yard for me, and he later admitted upon inquiry that even the critters wouldn't touch it. Our critters obviously have standards.) At any rate, this week's tea room recipe is most certainly *not* a dud, and I hope you'll give it a try! Preheat oven to 350 degrees. 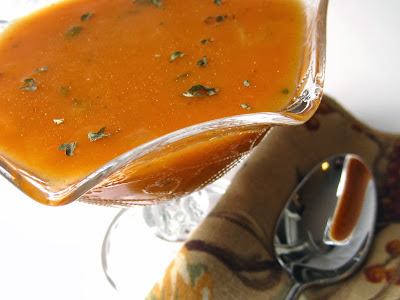 In a small mixing bowl, add the onion soup mix, French dressing and apricot preserves, stirring with a wire whisk until combined well. Using a 9x13-inch pan prepared with cooking spray, spread one-third of the sauce mixture. 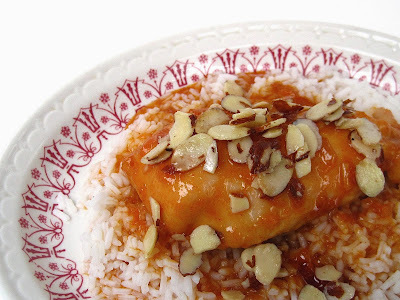 Add chicken breasts to the pan, then pour the rest of the sauce evenly on top and bake for 1 hour. Meanwhile, in a small skillet, melt butter and sugar over medium-high heat, until the mixture is bubbling. 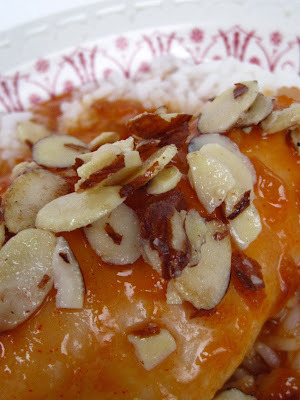 Add almonds and stir constantly until all the almonds are coated well. Remove from heat and set aside until chicken has cooked. Use the caramelized almonds as a garnish when chicken has finished baking. Serve over rice if desired. It's almost a rule with me to try to match the tea I am drinking to the teacup, but this time I realized I don't really have any "apricot" colored teawares. So I went with the next closest color, the peachy-pink background of this chintz teacup I've had for years. It's very springlike and totally out of season color-wise, but I love it anyway and hey, if I make the rule, I can certainly break the rule! The tea is a flavored black Apricot Tea from Upton Tea Imports. I discovered the silver packeted sample hidden amongst an old pile of magazines I'd let stack up, which was almost like receiving an unexpected gift—from me to me! I'm glad Upton puts the date tea is ordered on the packet, because it let me know this is still fresh, having been ordered in August. And oh, friends, if you could have smelled the fragrance wafting from this packet of tea when I opened it ... divine! 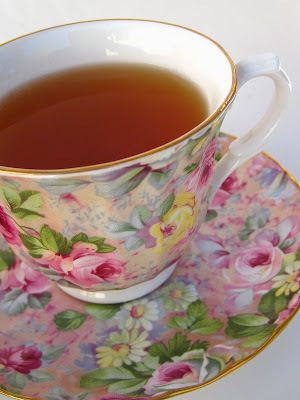 My only tweak of this tea was that it wasn't quite as sweet as I would have liked, and for the first time in years, maybe, I actually added a teaspoon of sugar. 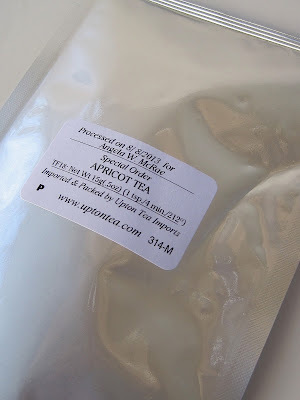 Then, I was quite, quite happy with this Apricot Tea! In the past I've made a chili with black tea and a chili with green tea, but this time when I heard a cold snap was on the way I decided to experiment with a chili made with oolong tea! Some of the ingredients, interestingly enough, were free. Before going in to Barnes & Noble to meet my friend Deberah for tea and a snack the other day, I sat in the parking lot typing my grocery list into my iPhone. 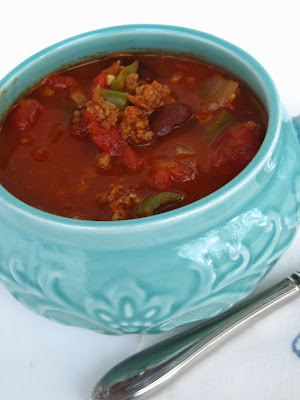 I knew I needed meat, tomatoes and tomato sauce, and when I looked up an old recipe from a past blog post, I realized I had left off green peppers and added that to my list before going to join my friend. So, Deberah and I sat down at B&N to catch up on our lives and the various projects we are working on together. After a while Deberah reached in her tote and said, "Oh, I've brought something for you. I just picked these from the garden this morning." And she hands me two big plastic baggies stuffed full of a lovely variety of peppers, including the very bell peppers I needed! How did she know? 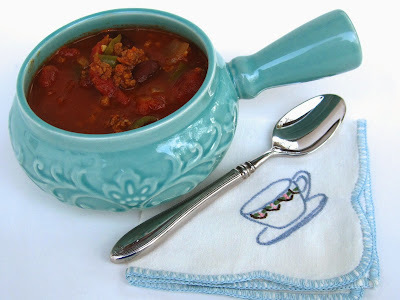 I can't help thinking this delicious and spicy chili tasted even better than expected because of the fresh peppers I was able to use! My enjoyment of a vintage plate is inversely proportional to how much I paid for it. That is to say, the less I pay, the more I like it. 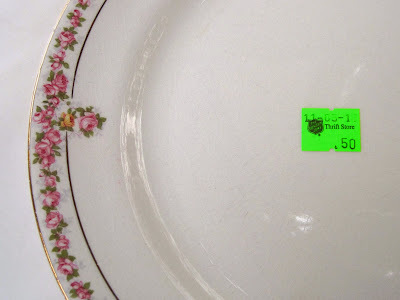 And so I *love* this plate I found at the Salvation Army Thrift Store in Carrollton, one of the places my aunt likes to shop and where I'm now a regular. It has a lot of crazing, which just adds character, but otherwise this pretty rose-rimmed plate was just perfect. I realized a while back that buying thrift store castoffs is a great way to gussy up food gifts. 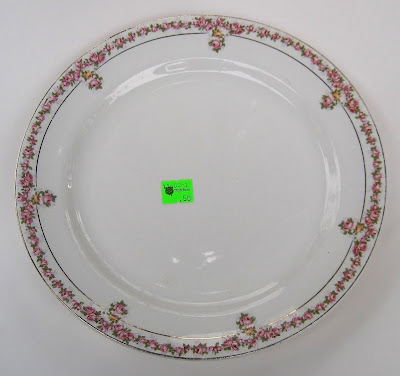 I like this plate a lot, though, so it remains to be seen whether anyone's Christmas cookies will be delivered on it this year! 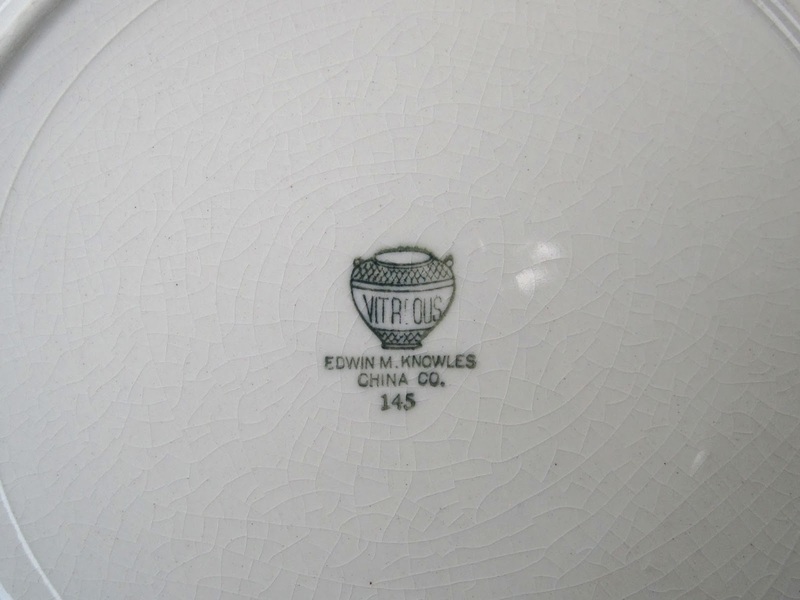 The backstamp says it was made by the Edwin M. Knowles China Co. I've been unable to determine a date or pattern name, but considering the price, I'm more than happy with my new plate! It's time for toy tea sets! The wisdom of Uncle Si — that's a fact, Jack!